When I say “organic,” you say—??? What word did you think of? It was probably something like, “healthy,” “green,” “eco-friendly,” etc. Thanks to the Great Greenwashing of the 21st Century, we have highly positive associations with foodstuffs that carry organic certifications. In a food system where we are desperate for affirmation that our consumption choices won’t slowly kill us, that little green badge can feel like a shining beacon of confirmation that this product isn’t just safe to eat, it’s GOOD for you. But what if that’s not the case for the people that GROW the food? What if “going organic” is actually a death sentence for a farm? What if food that has been grown organically for generations isn’t able to be labeled as such? Coffee is grown and traded differently than any other mass-produced crop, due in part to its biology and in part to its history. Globally, coffee is one of the least mechanized agricultural industries, with the vast majority of production labor still enacted by hand, by humans. Because coffee cherries on a given branch ripen at vastly different times, workers have to harvest it by hand, selecting only ripe cherries. And it’s not a one-and-done situation—workers must pass back over the trees several times in a harvest season to get the rest of the crop as it ripens. While machines aid in the sorting process, the best coffee is still sorted by hand. And every step after that—shipping, roasting, packing, distributing, brewing, serving—is often less mechanized than you would think. All in all, coffee is incredibly labor-intensive. In the hundreds of years that we have been growing and drinking coffee, the process has changed very little. The majority of the world’s coffee is grown and harvested by small family farms in developing countries. 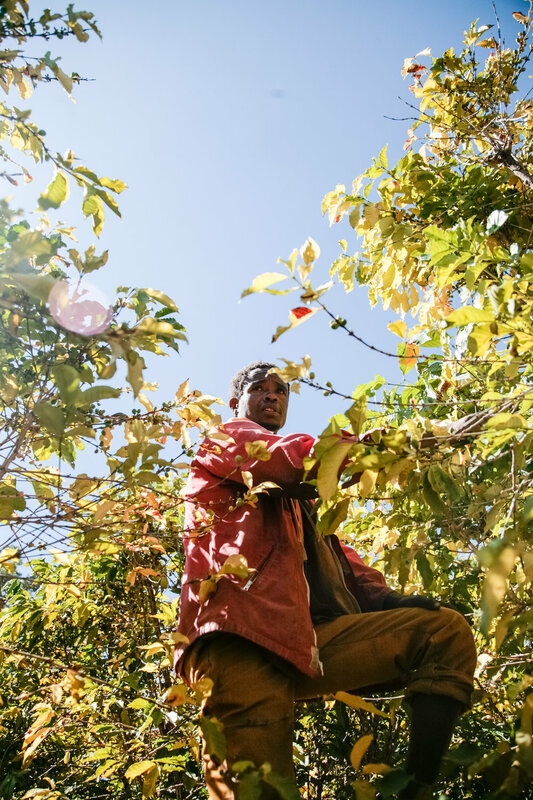 The average coffee producer in Ethiopia might only harvest one or two bags per year from their small plot of trees, to supplement their income in addition to other crops. These thousands of small farmers around the world usually cannot afford pesticides or fertilizer. They use natural pest management, such as inter-cropping, to strengthen their coffee trees against blight and pests. They are growing their coffee completely organically, as their family has always done, but they’re not allowed to call it that because…capitalism. Becoming certified organic is an enormous undertaking for a farm, even for the larger coffee estates. It’s expensive and risky—one farmer in Honduras saw a 90% drop in yield when he transitioned his crop to organic. Imagine making 90% less money next year, could you stomach that? And while 6% of Costa Rican coffee farmers pledged to go organic in the ‘90s, apparently only 1% of them stuck with it. While organic coffee pulls higher prices on the market, it’s often not enough to offset the cost of going organic, losing your crop, and paying thousand of dollars a years to maintain your certification. Because it’s not free—even if you are an organic farm, have always been an organic farm, you have to pay for the right to say that. Again, because capitalism. And what’s extra stupid is that organic certifications still allow for the use of some synthetic pesticides, and have few requirements around other aspects of sustainable growing. The certifications say nothing about how a farm treats its workers, or its relationship to its community, because organic premiums often don’t reach the people at the very beginning of the supply chain. Plus, it says very little about how water sources, other plants, and wildlife are impacted by the farm. That little green badge is simply an erroneous cheat sheet, a way for us to quickly make decisions about purchases, when we really should be digging in deeper, researching the beverage we drink every day, and learning about where it really comes from. It’s way more important to buy direct trade coffee than it is to buy organic. It’s more important to buy coffee grown by women’s collectives. Transparency, ethics, and impact on human lives at origin are all waaaay more important than you feeling smug or healthful about your coffee choice. But here we are, greenwashing everything, creating a market for organic coffee, and putting the onus on farmers to meet that demand. On the consumer end, we treat coffee as a personal and individual choice, something we can take or leave, or cut back on arbitrarily, and no one gets hurt. In the rest of the world, those “choices” are actually privileges, and they create an inarguable reality. Farmers grow coffee because their parents grew coffee, because coffee is in demand, and because, despite rapid climate change, their land still yields it—for now. They grow as much as they can, as well as they can, they organize collectively, cooperate within their communities, and hope a blight doesn’t come or a global surplus doesn’t drive prices down. And here in the U.S., our endless quibbling over whether we like coffee and how we take it and whether it’s organic or not…well, it’s irrelevant. A small farmer in Harrar checks his ailing coffee trees while explaining the challenges his farm has faced that year. Ethiopia, Jan. 2017.